Joe Parkin’s A Dog In A Hat. Must-ride becomes must-read. One simple measure of the quality of a book is how sad you are when you finish. When I reached the last page of Joe Parkin’s A Dog In A Hat, I was pretty bummed. It was a beautiful ride but I felt like I’d made and lost a new best friend in a week’s reading. 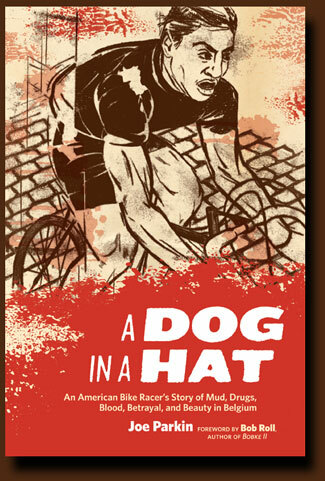 A Dog in A Hat is Parkin’s story of his years riding mostly in Belgium in the late 80’s. He takes you inside the crazy world of Dutch cycling –the kermesses, odd-ball characters, the drugs and bribery, the mud and madness, the whole ball of Dutch wax. He rode Liege- Bastogne, he rode Paris Roubaix, he watched a teammate prep himself by jabbing a syringe full of amphetamines into his leg four times. Parkin’s style is honest, self deprecating and deceptively simple. Before you know it, you’re deep inside the peloton. From the first page, you feel like you’re his side-kick buddy. He gives you the secret Belgian handshake. The book is part Hemingway and half Hunter Thompson. Fear & Loathing on the Kermess circuit. Parkin chronicles his own ethical struggle with the doping choice — one he frames in a personal way that makes you fully understand the difficulties and temptations. And he comes to terms with accepting his own role in the peloton and what he could hope to accomplish without the syringe. Despite the ever present drugs, what’s most evident in the story is Parkin’s joy and passion for racing in this wet, cold and rainy part of the world. It’s not an expose; it’s a love letter about racing in Belgium. A place where cycling is so much a part of the culture that riders would change into their kit in people’s homes a few blocks from the start line. Parkin takes you all over the world, including riding for Raul Alcala in Mexico, his foray into European cyclocross and representing the USA in a World Championship Road Race. His description of a Polish rider trying to shove his way into Parkin’s spot during a stage race was priceless. After repeatedly ignoring the guy’s obnoxious behavior, Parkin backhands him across the face so hard he thought his hand had shattered. The story of how Parkin learned that a race was being bought and sold in a breakaway — and what he needed to do to get in on the payoff — is a wonderful bit of writing and Parkin at his best. He’s a natural storyteller, curious, funny, with a good eye for detail. The only consolation in reaching the last page is knowing Parkin has another book out soon. This is a must-read for anyone who wonders what it’s like to leave the US as a naive teen and throw yourself into the strange world of Belgian-style bike racing. Plus, you even get a forward by the man responsible for Parkin’s journey: Bob Roll. Enough said — you’re Amazon bound. « Wiggins: “I’m a better rider than Lance.” A perspective from Hey Arnold and Dirty Harry.